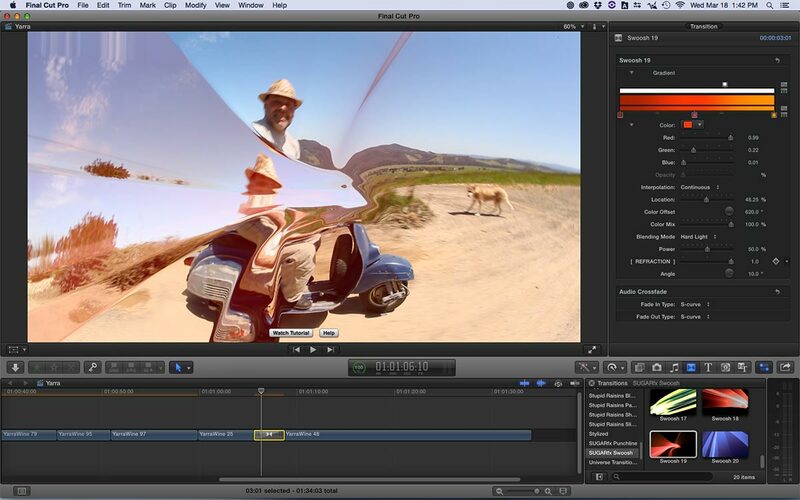 FxFactory by Noise Industries has evolved into one of the most versatile and eclectic collections of effects for Apple Final Cut Pro X and Motion 5. 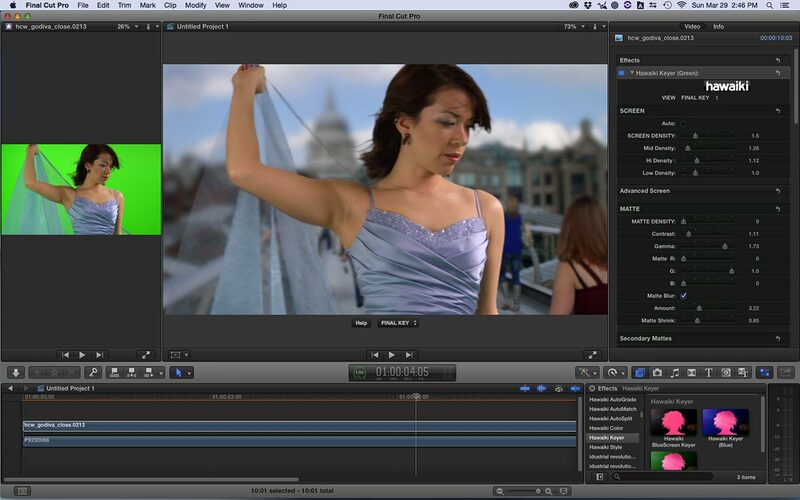 In addition, many of the effects are also compatible with Adobe Premiere Pro CC and After Effects CC, as well as legacy versions of FCP and Motion. Noise Industries partners with a global array of developers to produce a steady stream of new and updated effects. This has been made possible by creative use of Apple’s built-in development tools such as Quartz Composer and Motion’s template creation and publishing features. The latter has allowed more tech-savvy creatives to become their own effects designers. 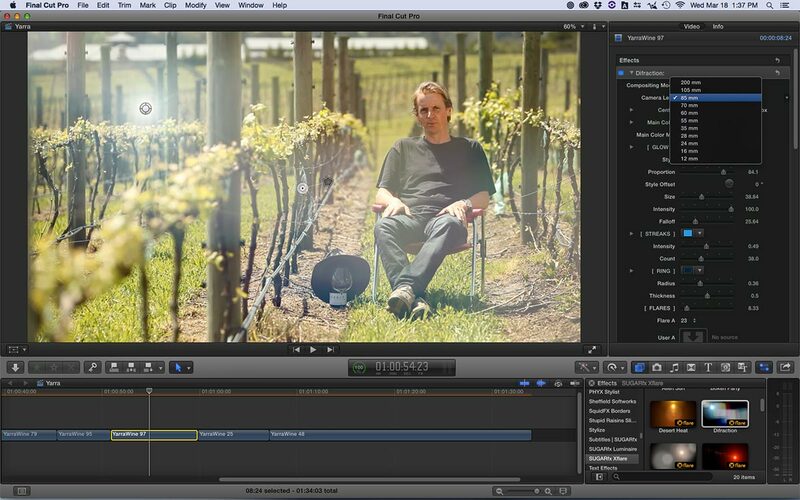 Much like suppliers have developed customizable After Effects projects and sold them as stock clips, now users can create Motion templates that appear as a filter, transition, title, or generator. Noise Industries has partnered with a number of these designer/developers to populate its FxFactory repertoire. 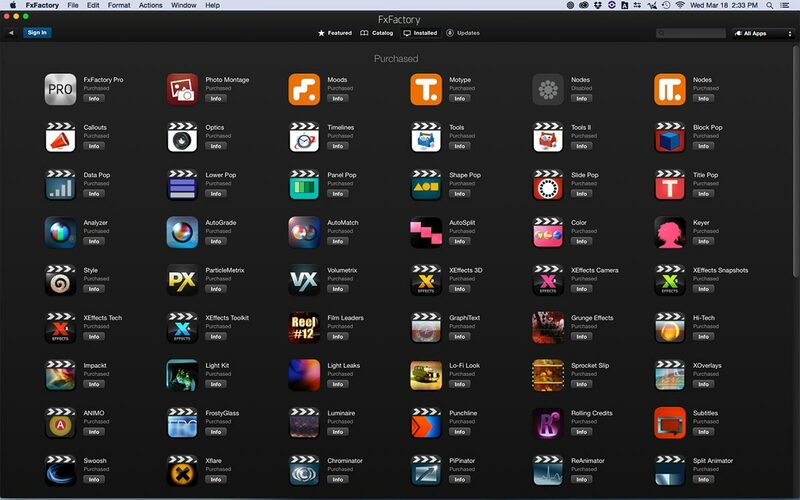 The FxFactory platform has evolved into an app store for plug-ins. By installing the free FxFactory application, you can manage your plug-ins, as well as perform in-app purchases and updates. Plug-in pricing is set by the individual developer and typically ranges between $29 and $99; however, some are less or even free, while more complex effects may cost several hundred dollars. Noise Industries also offers its own Pro package of effects. If you only want one effect, all you have to do is purchase that single effect and install the free FxFactory application to get up and running. Here is a sampler of some of their products, including newer releases. 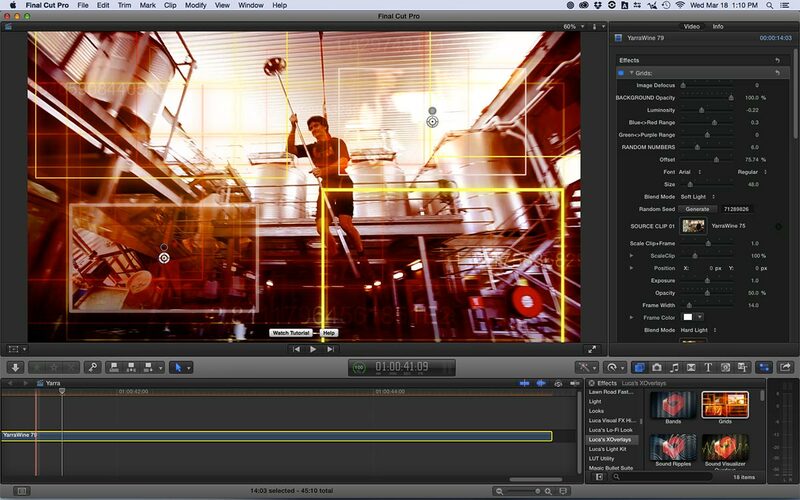 The first plug-in I’ll mention is Hawaiki Keyer. Having a high-quality blue/green-screen keyer is a necessity and not just a frill. 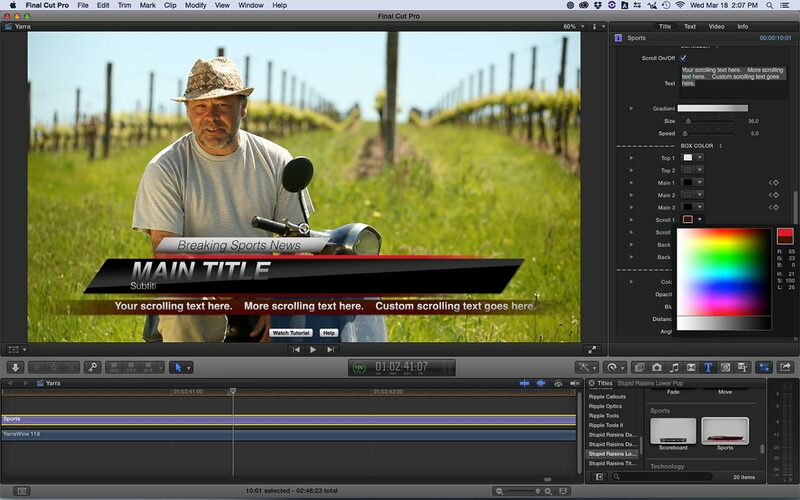 The built-in FCP X keyer is good for easy jobs, but the quality of the edges leaves a lot to be desired. 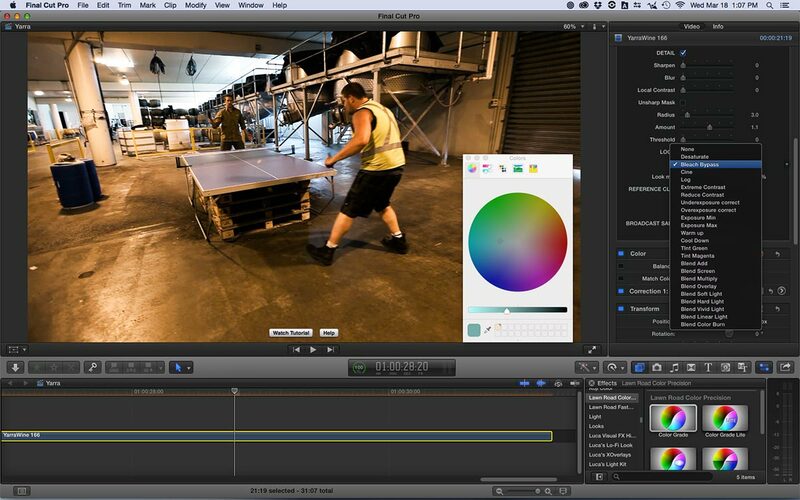 Hawaiki Keyer does a significantly better job and is also compatible with Adobe Premiere Pro CC and After Effects CC. This plug-in includes a blue-screen and green-screen filter with a slew of advanced controls for matte density, edge control and even garbage-matting. In testing, I found it to surpass not only several other third-party keyers that I have on my computer, but also the version of Keylight that comes with the stock After Effects CC installation. Hawaiki Keyer has recently been updated to version 2.0. 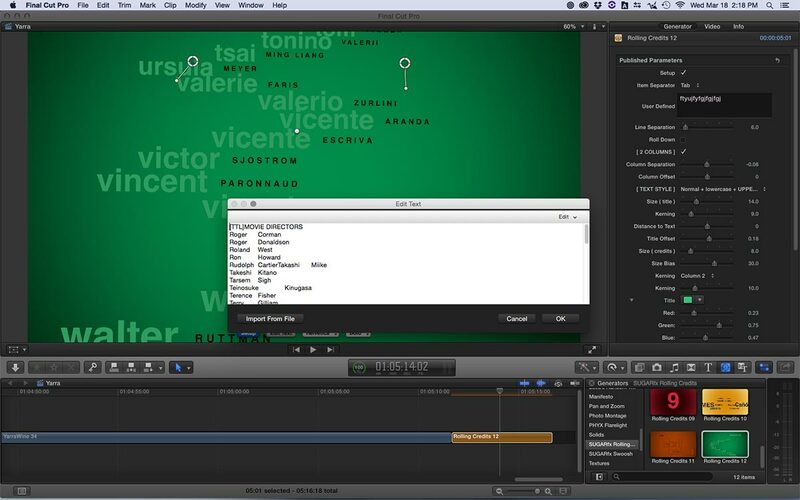 If you were a fan of the Apple LiveType text animations, you’ll be interested in CineFlare CineText. This a set of title effects that employ Motion behaviors to animate the text into place with ballistic attributes, like eases, bounces, spinning, slides, and motion blurs. 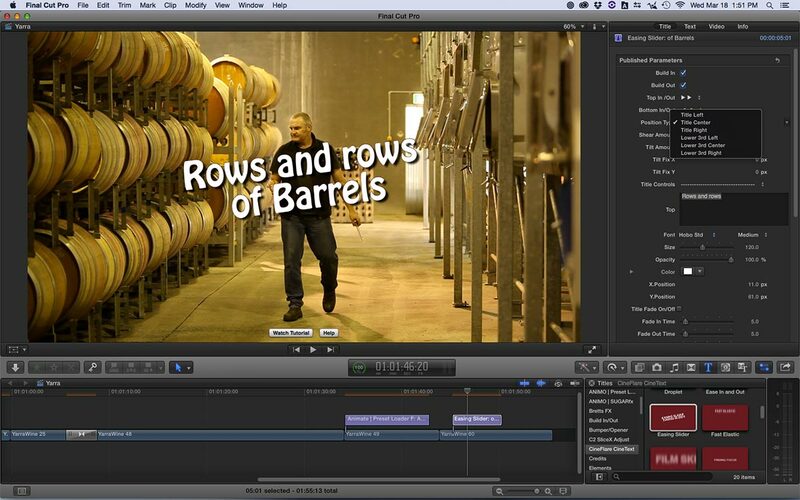 As with most FCP X text tools, you can alter fonts, sizes, and face and edge attributes. Hawaiki Style is a template-based title modifier to turn basic text titles into stylized variations. The choices include numerous chrome, metallic, distressed, bevelled, and textured options. Each selection offers a wide range of customization. If you think of the different text looks you can create with Photoshop’s layer styles, then you’ll understand how Style may be used within FCP X.
FxFactory products include a number of color correction filters, including color wheel-based plug-ins, like Hawaiki Color and Yanobox Moods. Many users prefer simpler slider-based grading effects. If that’s you, then Hawaiki Autograde and/or Lawn Road Color Precision are good choices. Both of these include similar tools, based on photographic adjustment methods. If you still want the effect of a three-way color corrector, they also integrate the use of the Mac OS color picker as color balance wheels. Finally, each has a module for stylized looks for various cinematic treatments, like bleach bypass. There’s nothing cooler for stylizing an image than paint, watercolor, or cartoon effects – if these are tastefully done. Artitude from Sheffield Softworks is one filter that probably gives you more of these options than any other single filter of its type. Simply apply the effect and select the artistic style from a lengthy pull-down menu. Then adjust parameters to taste – like color, line style and smoothness, and stroke methods. FxFactory offers a number of techie displays and transitions that feature a lot of different heads-up display graphics useful in sci-fi projects. A variation on this theme is Luca’s Overlays. This is a series of graphic overlays, including visualizers, grids, and graphic patterns. 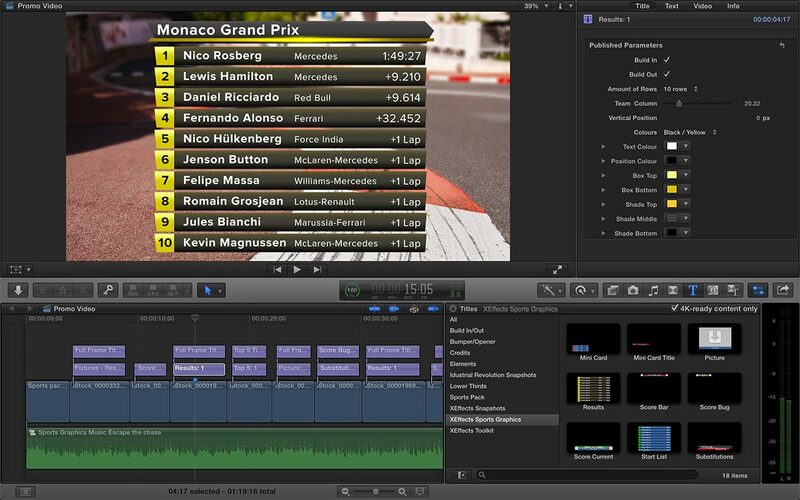 Other Luca Visual FX offerings include Hi-Tech, a collection of overlays that work well for tech monitor screens. SUGARfx has worked with Noise Industries for a long time and offers many different types of effects. If you like lens flares, then Xflare gives you plenty of options, including a range of flare and bokeh filters to pick from. Once you apply the effect, you can adjust lens type and flare attributes, like position, streak style, length and color, and much more. They have also developed a number of transition effects like Swoosh. This is similar to a common swipe or light streak transition effect that you might find in a stock clip collection, but with one important difference. As the transition moves through the image from clip A to clip B, the area behind the streak is optically distorted, making it look more organic than other similar effects. 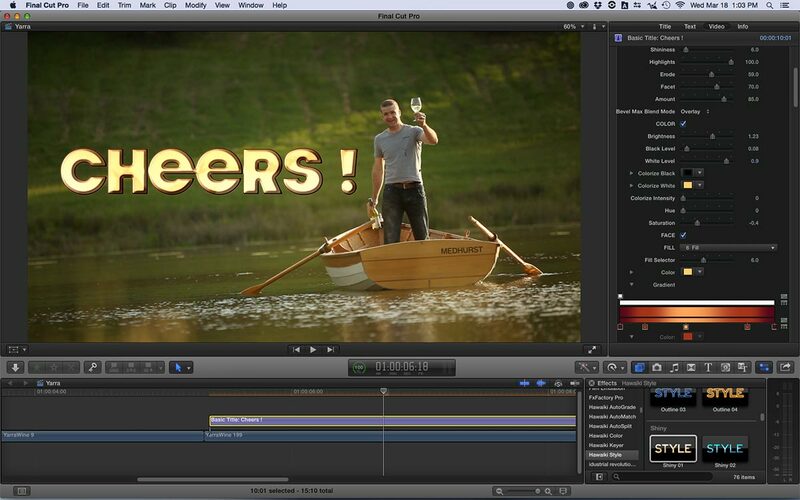 SUGARfx all offers a number of title effects that take advantage of the template concept. I particularly like Frosty Glass for adding titles over picture. This gives you a number of modifiable glass styles to make the background translucent, so that titles are easily read. 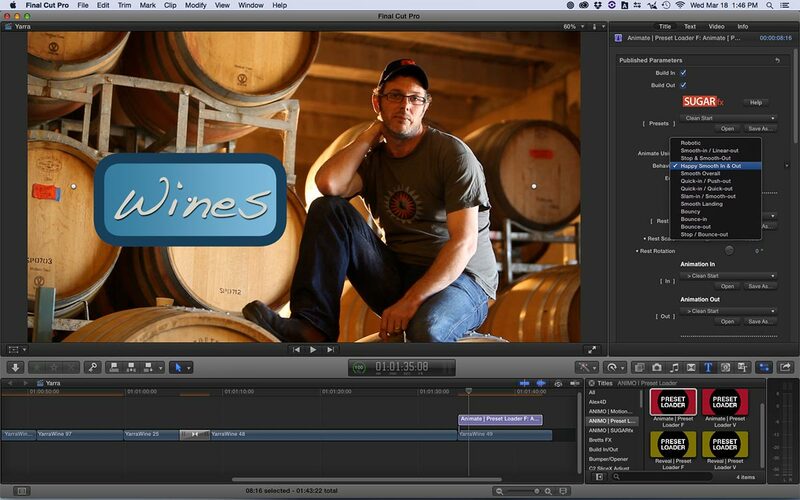 The templates include animation moves to bring the glass and text into frame. You can modify the fonts and sizes, and their edge styles. If you don’t like those, simply use the effect without the text and then add a separate title effect on top. If you want more title effects, there’s also Animo, which is a set of templates for animation moves to reveal images and also fly graphics in over an image. The Animo Preset Loader uses a multi-colored, target-style background graphic together with text. The animated positions and color palette for this graphic can be adjusted. Or, the background colors can be replaced by video. The last SUGARfx plug-in I’d like to showcase is their Rolling Credits generator. This is primarily designed for long credit rolls, like motion picture end credits; however, you could also use it for any long list. There are a number of templates and styles, all of which can be modified as needed. idustrial revolution has been another frequent FxFactory supplier with a wide range of idustrial and XEffects products. 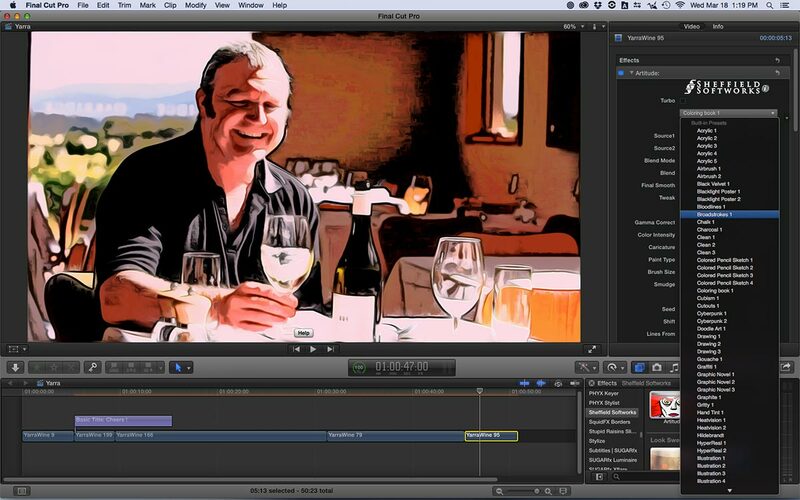 One package that every editor will find useful is the XEffects Toolkit. 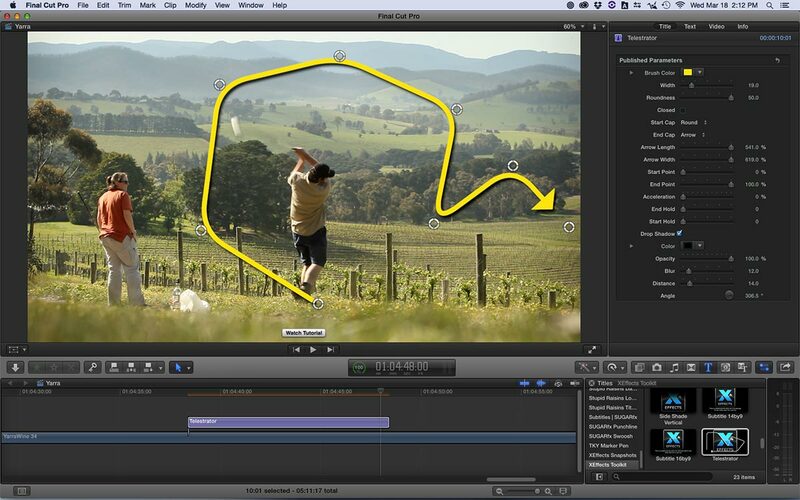 FxFactory includes several toolkit products, including others from Ripple Training and Tim Dashwood. Each variation will contain both common and unique items, so you might want more than just one. The XEffects Toolkit includes a potpourri of filters, such as masks, resize effects, basic compositing moves like a quad-split build, glows, gradient effects, and more. 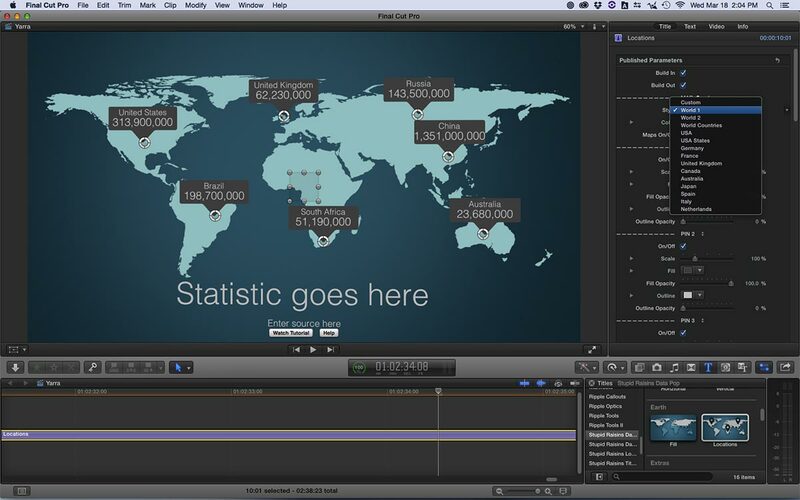 There are both filter and title effects, including an underliner and a telestrator-style line animation effect. If you work in sports production, then the newly released XEffects Sports Graphics package is just what you’ll need. This is a set of 4K-ready customizable graphics. It’s primarily a number of title templates, but also includes a left and right transition effect and a background generator. The title templates cover lower thirds, leader boards, player headshots, and score banners. Many of these templates include drop wells for video or still images and team logo graphics. Each template includes build-on and build-off animations. FxFactory offers plenty of solutions for the display of text-based data, too. Several of these options come from Stupid Raisins, who has developed a number of product groups with the “pop” suffix. One example is Data Pop – a series of design templates for displaying numerical information as graphs, bar and pie charts, maps, Venn diagrams, and more. The templates combine a transparent, gradient, or solid color background, the ability to add and alter data, and customizable text. Another product of theirs is Lower Third Pop. This is a series of lower third banner templates. These include a number of artistic, plain, and news-style designs. There’s even a scrolling banner, just like most typical cable news channels employ. Simply customize the colors, static text, add your own logo, and then update the scrolling text block with your own information. I’ve saved the most complex for last – Yanobox Nodes 2. 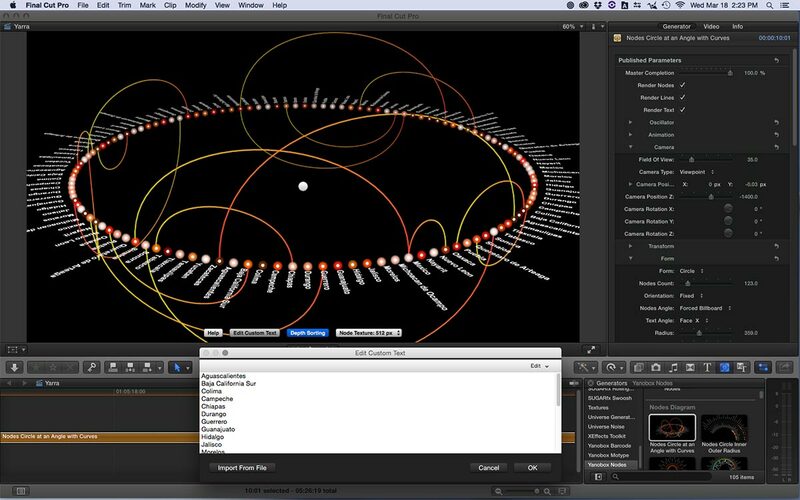 Nodes is a complex series of text and line animations that display any type of node-connected form, including network grids, animated forms, universes, and dynamic data line animations. Think of something like a Spirograph pattern. These are incredibly complex patterns that would take someone a long time to create and animate from scratch. Yanobox has made this super simple, by equipping Nodes with a series of excellent preset starting designs. Generally there are two main components to Nodes: the text and the design. Pick from a selection of presets and then vary the way the design animates, as well as how the lines are generated, connected, or displayed. Your data will be based on words that you import from a text file. So, if the text should be the names of US cities, simply import a document with those names in the order they are to appear. Based on the functions you can modify, there’s an astronomical number of variations that can be created. I’ve only touched on a few of the outstanding products available to editors and designers through the FxFactory platform. Unfortunately these are limited to Mac users, but other than that, the product offerings certainly cover a bit of something for any editor or designer. Even though many of these effects are driven by templates, they can be tweaked in ways that will add a unique look to your project. 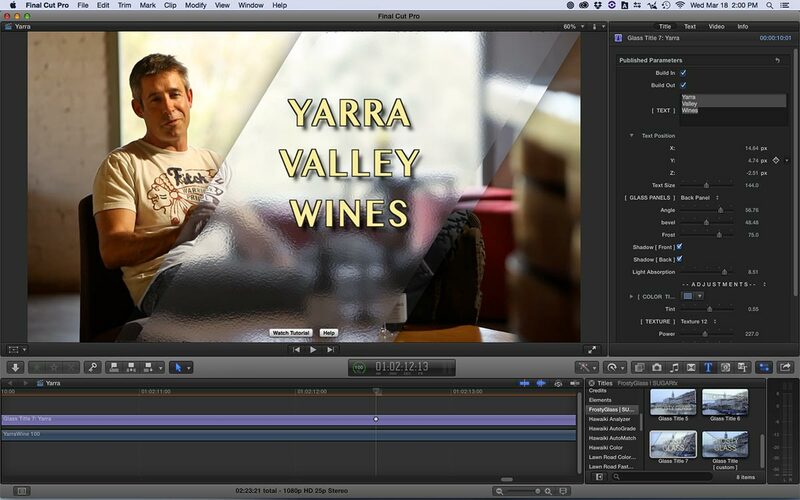 This enables the sort of quick and stylish production that clients like and come back for. This entry was posted in apps-gear-filters.